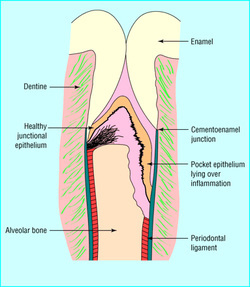 Advanced bone loss is generally associated with chronic periodontitis and consists of bone loss in a vertical direction down the site of a root. The defect is essentially a moat or ring around the root surface. Visually, this is basically a valley with root on one side and exterior bone on the other. Such a bony defect is found when pocket probings are greater than 5 or 6mm. The pathogenic microbes living in deep pockets cause inflammatory destruction of the attachment ligaments between the root and bone. In response to the presence of these pathogens, the immune system attacks bone in both vertical and horizontal directions in what appears to be the body’s rejection of foreign materials attached to the tooth surface. In an attempt to restore structural function to teeth in this condition, periodontists perform osseous (bone) regeneration surgical therapy. During this procedure, anesthesia is used and diseased microbe contaminated tissue is removed. The tooth root is thoroughly cleaned with ultrasonic and hand instruments similar to non-surgical root planing. When all the infected tissue is removed, the root surface is treated with various root conditioning agents. Emdogain, a regenerative stimulant, may also be used to attract new cells to attach to the newly prepared root surface. The valley portion of the bone defect is filled with various types of bone granules. Bone granules can be taken from some other location in the patient’s mouth. Dr. Ford most often uses freeze dried donor bone which has been sterilized and treated with biologic mediators to stimulate formation of new bone. The gum is sewn back to the teeth and bone and the area is allowed to heal for six months to a year before the degree of bone fill can be determined. Predictable fill of bone defects is very dependent on the health of the patient and his/her ability to heal. Risk Factors such as smoking, diabetes, metabolic syndrome, osteoporosis, and bisphosphonate therapy often reduce the predictability of bone fill. Dr. Ford assesses the individual situation for each patient. The best result is associated with patients who don’t wait too long for treatment and who have re-established healthy gum tissue around the teeth. Good oral hygiene and healthy gum tissue will foster a positive environment for bone to regenerate in.